Want to treat yourself to an authentic Italian meal in Nashua, NH? Let Bertucci’s provide you with the next best thing to visiting Italy. Our freshly made dough, specialty tomatoes, and roasted vegetables are guaranteed to be at their freshest, whenever you choose to dine with us. 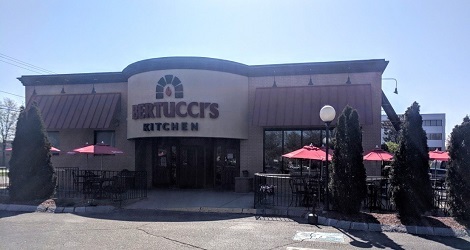 Dig into our brick oven pizza, pasta made using family recipes, or indulge in a sweet Italian dessert at Bertucci's in Nashua, NH. We offer a warm, inviting atmosphere that is ideal for all sorts of occasions and celebrations. Our Nashua establishment is the answer whether you’re looking to spontaneously take your whole family out after a long day, you want to have a special date, or you are planning a party for a milestone birthday or anniversary. Our dedicated team will make sure you have an amazing meal and get plenty of time to make great memories together, whether you have one person or twenty accompanying you. If dining-in with us isn’t an option for you right now for one reason or another, we hope you will take advantage of the carryout services we offer instead. Our entire menu is available via this option and there are a couple of ways you can place your order. If you would prefer to order over the phone, our Nashua staff will be happy to assist you. If, however, you would rather use your smartphone to order your meal, download the Bertucci’s app to get started.